This easy hummus pairs perfectly with hummus and fresh veggies. The origins of hummus can be traced to as far back as Cairo, Egypt during the 13th century, but it certainly has not lost its taste nor popularity. I know that on my dad’s side of the family, which hails from Syria, the dip is a treat that I always look forward to, especially when my mom sets it down on the table with a pile of carrots or pita chips. 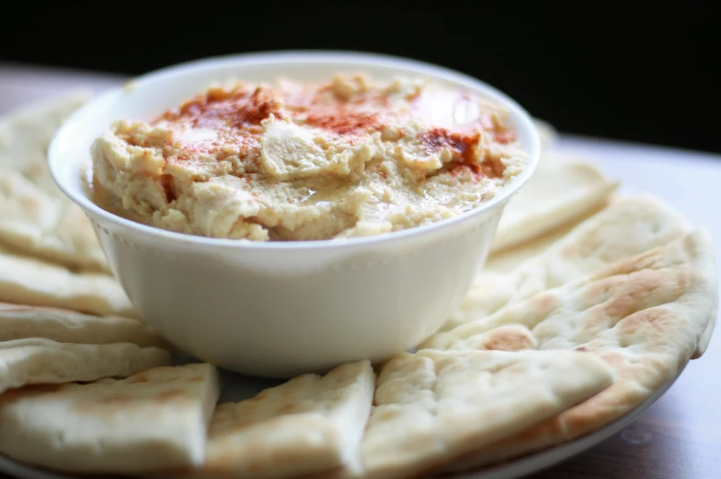 This food dip, made from mashed chickpeas, garlic and several other ingredients, is sure to satisfy anyone with a craving for a taste of the Middle East. From my home to yours, I hope you enjoy this recipe! Drain and rinse the 2 cans of chickpeas (garbanzo beans). Set some of the liquid aside. Add the chickpeas, tahini, 2-4 cloves of garlic (depending on your own taste), the juice of the 2 lemons (also depending on your taste) and a half teaspoon of sea salt into a food processor or blender. Blend all of these ingredients until completely smooth. If the hummus is too thick, you can add some of the moisture from the beans into the mixture. Scoop the finished product into a bowl and sprinkle with paprika and olive oil. Dip with some carrots or pita chips and enjoy! Don’t forget to check out our recipe video for Mom’s hummus at @HighlanderTV on YouTube!